The London Piano Institute offers adults in the Kensington area the opportunity to learn from one of the UK’s most sought after piano tutors, Master Piano Instructor, Celine Gaurier-Joubert. 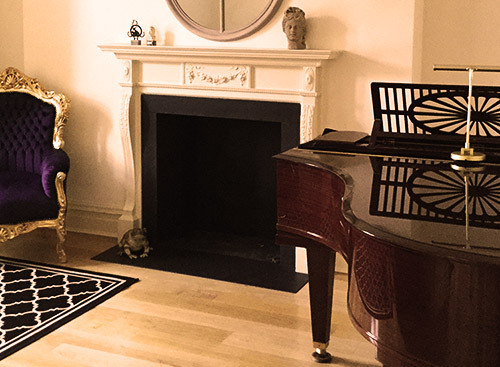 With over 20 years of experience teaching and performing across Europe, Celine now offers piano lessons in Kensington to discerning adults who are passionate about learning to play this great instrument. The prestigious studios of The London Piano Institute are unrivalled amongst piano academies in Kensington. With commanding views and beautiful works of art adorning the studio, they provide the ultimate setting for students to immerse themselves in their music and really learn how to ‘feel the piano sing’. Celine is a firm believer in learning the basic techniques right from the start and has seen many students who have had to ‘relearn’ what has been previously taught in order to move forward. However what sets The London Piano Institute apart is Celine’s ability to bring the music to life and to impart this with her students. Learning to listen to what the composer intended enables students to gain a greater understanding of the music and ultimately to enjoy their musical practice more. We naturally offer classical piano lessons at The London Piano Institute, however in addition, we also offer students the opportunity to take Jazz, Blues, Rock or Pop lessons. Our Master Piano Instructor, Celine, trained alongside some of the World’s most notable Masters including Thierry Lang, world-renowned Blue Note artist and Switzerland’s most eminent jazz pianist and is able to pass on the skills she has learnt to students of the Institute. All students taking piano lessons with us in Kensington are fortunate to be able to learn on either a Bechstein or a Goetze grand piano, both of which provide students with an inspirational experience. The Institute offers solo piano instruction in our Mayfair piano studio, just 10 minutes from Kensington or, alternatively, for students looking to acquaint themselves with other like-minded individuals we offer group piano lessons. Each way of teaching has its benefits. Solo piano instruction allow the teacher to focus on a student’s individual needs and progress at a speed that is comfortable for them, whilst group piano lessons provide students with support and encouragement from other students studying at the same level. We offer piano lessons from Monday to Friday and in the evenings if preferred. We recognise how important it is to allow students to perform in front of an audience, so we regularly host Musical Evenings at The London Piano Institute near Kensington. These evenings are a wonderful way of allowing students the opportunity to show off their new skills in front of a non-judgemental audience plus of course the opportunity to meet new friends!